Winter is the perfect time to make marmalade. The oranges that are considered the best for marmalade – Blood, Seville, Cara Cara – are most readily available December & January. By February into early March, they disappear for the year. They all have a bitterness and high pectin content (important for thickening) that is prized by marmalade afficionados. Marmalade began more than 2,000 years ago as a solid cooked quince and honey paste similar to today’s membrillo, the Spanish quince paste that is typically served with sheep-milk cheeses. Known as melomeli in ancient Greece and melimela in Latin, it was used both as a preserve and a reputed remedy for digestive complaints. The Portuguese took up the product, perhaps via the Arabs, substituting sugar for the honey, around the 10th century. 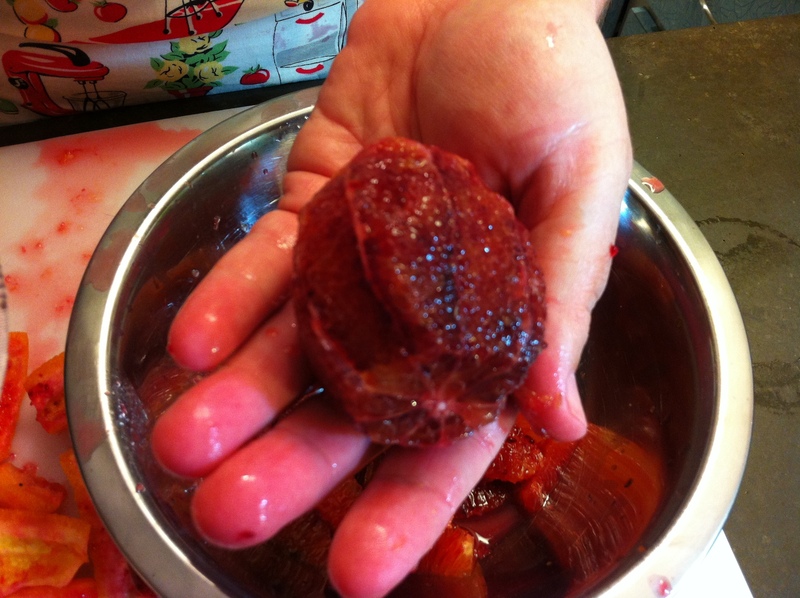 They called it “marmelada,” which derives from the Portuguese marmelo, or quince. The first shipments of marmelada, packed in wooden boxes, arrived in London in 1495. Fabulously expensive and imbued with purported medical and aphrodisiac powers, it was a popular gift among noble families. 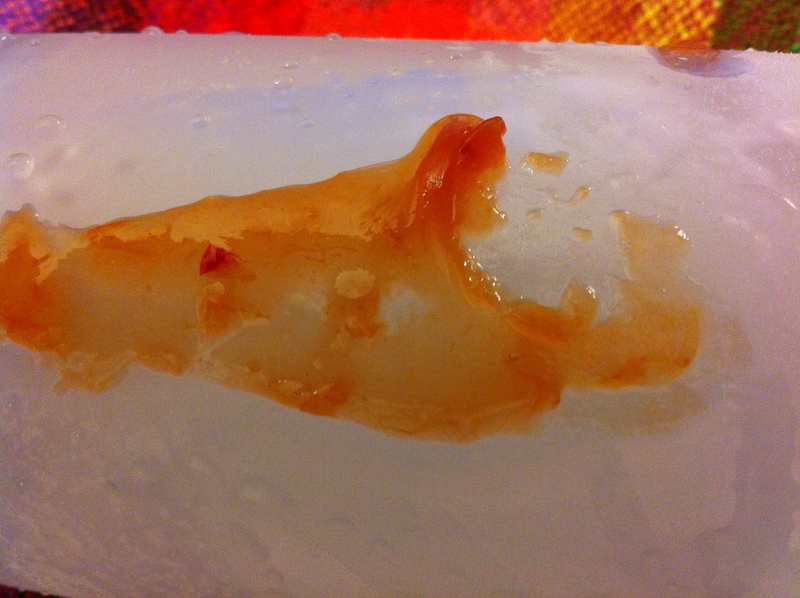 Simultaneously, a northern European version of a cooked quince and sugar preserve called alternately chardequince, condoignac, cotignac or quiddony sprung up. Flavored with red wine, honey, cinnamon stick and powdered ginger, it was taken at the end of a medieval feast, along with pears, nuts, sugar-coated aniseed and other sweetmeats whose purpose, harkening back to the ancient Greeks, was to ease an upset stomach. Versions of quince marmalade became a staple of “banquetting stuffe,” the elegant display of sweetmeats and confectionery served at the end of 16th- and 17th-century English feasts. Rolled and twisted into hearts and knots or flattened and then stamped with flowers and tarts, pale and rose-colored quince pastes were as decorative as they were therapeutic. Food historian Ivan Day offers period recipes and photos of these creations on his website. In the 18th century, the Scots pioneered the switchover from quince to orange marmalade. Many regions of the country were too cold for quince trees to flourish, and imported Seville (bitter) oranges had been available since the late 15th century. Cooks were now producing a thinner form of marmalade, stored in pots or glasses, achieved through a shorter cooking time. A succession of Scottish cookbook authors including Elizabeth Cleland, Hannah Robertson, Susanna Maciver, J.Caird and Margaret Dods, turned marmalade-making into an art form, introducing the term “chips” for shreds of orange rind, and refining techniques to produce marmalades that ranged from dark and chunky to transparent and golden. More significant perhaps than the switch from quince to orange marmalade, was the new Scottish pattern of serving marmalade as a breakfast and tea-time food rather than an after-dinner digestive. This coincided with the evolution of the legendary British breakfast, which in its 19th-century heyday could consist of eggs in many guises, bacon, sausage, broiled mutton chops, stewed kidneys and smoked fish with crisp toast and an array of rich breakfast cakes. Orange marmalade, honey and jam were ubiquitous accompaniments. While the “invention” of orange marmalade in 1797 is sometimes erroneously attributed to Janet Keiller, a Dundee grocer’s wife, she was among the first of a series of late 18th- and early 19th-century Scottish grocer’s wives who established commercial marmalade factories. Demand for store-bought marmalade had risen, perhaps facilitated by the growing number of women working outside the home. After a post-World War II decline in consumption, marmalade is now undergoing a comeback in Britain. Many home cooks continue to make their own, often using generations-old recipes. Because Seville oranges are only available for a few weeks in January and February, marmalade-making is a seasonal ritual. The enticing aroma of bubbling brews of oranges and sugar on the stove and the glow of newly filled jars of marmalade signal the coming of brighter days during the short, dark winter days. The annual World’s Original Marmalade Festival held each February at Dalemain Estate, in Penrith, Cumbria, England, is to marmalade lovers as California’s Gilroy Garlic Festival is to garlic aficionados. A paean to British marma-lade culture, hundreds of home cooks compete for titles in categories ranging from classic Seville Orange marmalade to the more eccentric Clergy Marmalade, for ministers, priests, rabbis or anyone associated with a religious group. 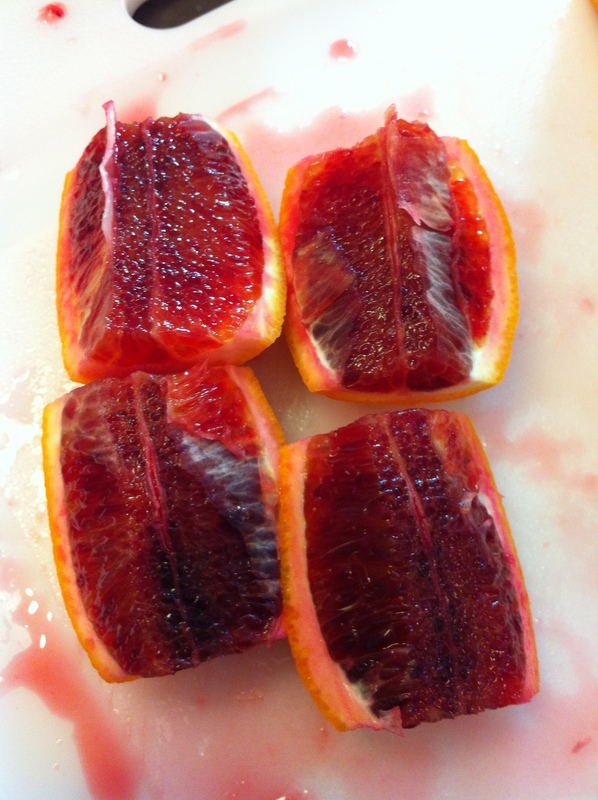 The more traditional recipes have equal parts sugar and water along with the citrus; no pectin. So, a recipe can have, for example, 8 cups sugar, 8 cups water, and anywhere from 2 – 5 pounds of fruit. This makes a very sweet-bitter combination. Of course, you can adjust the sweetness as you prefer. 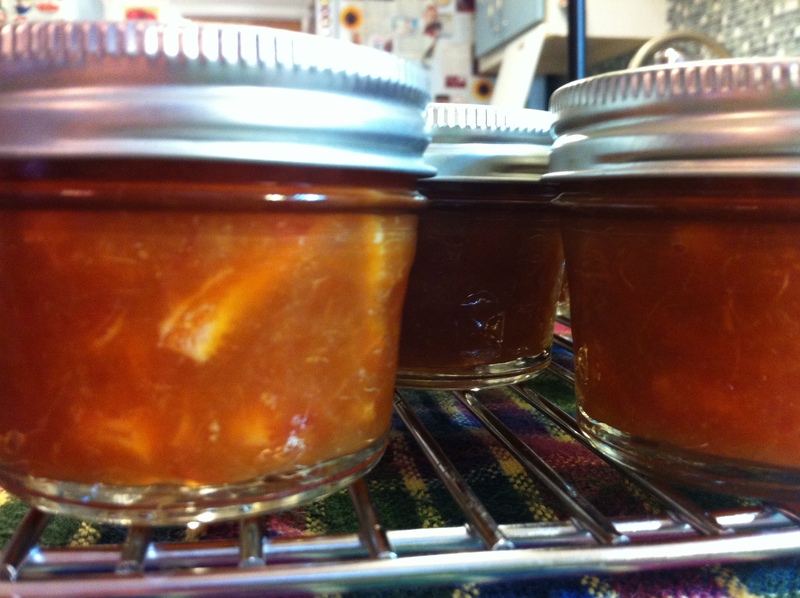 The finished marmalade in this recipe will not look the same as many marmalades. Because I use juice and honey as sweeteners, the marmalade is much more opaque than if I made a marmalade with sugar. Oranges typically used in marmalade are very seasonal and are only available 2 – 3 months a year in the winter. 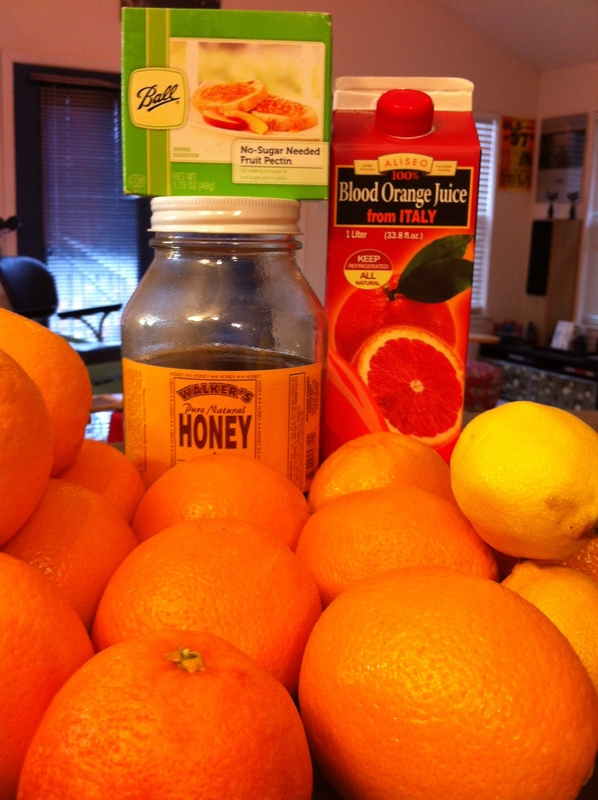 However, you can use any type of orange and regular orange juice. The flavor won’t be the same (probably sweeter), but will be delicious nonetheless. 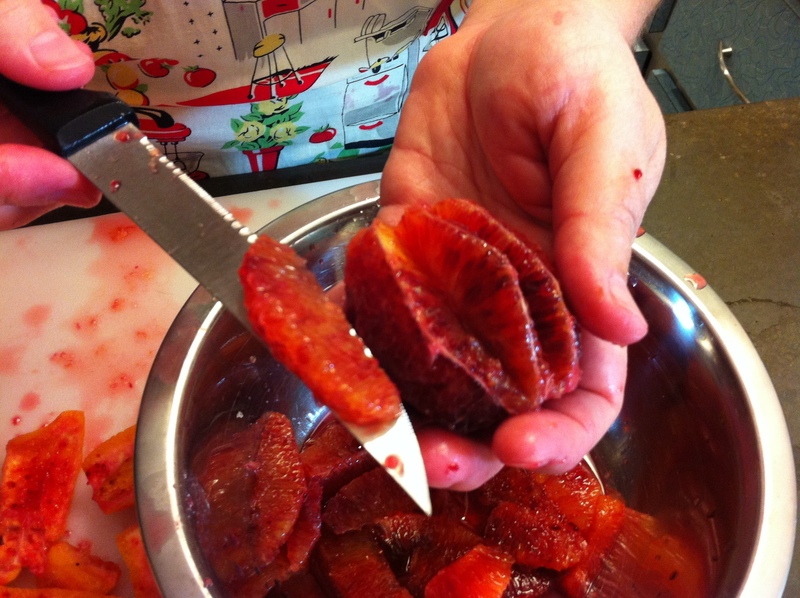 If you need to know about the how’s and why’s of canning sweet preserves, please look at my August 10, 2012 post, “Classic Strawberry Jam”. 1. Cut the ends of 2 pounds of oranges down to the pulp. The end cut off the orange. It’s a beautiful ruby color. Hence the name. 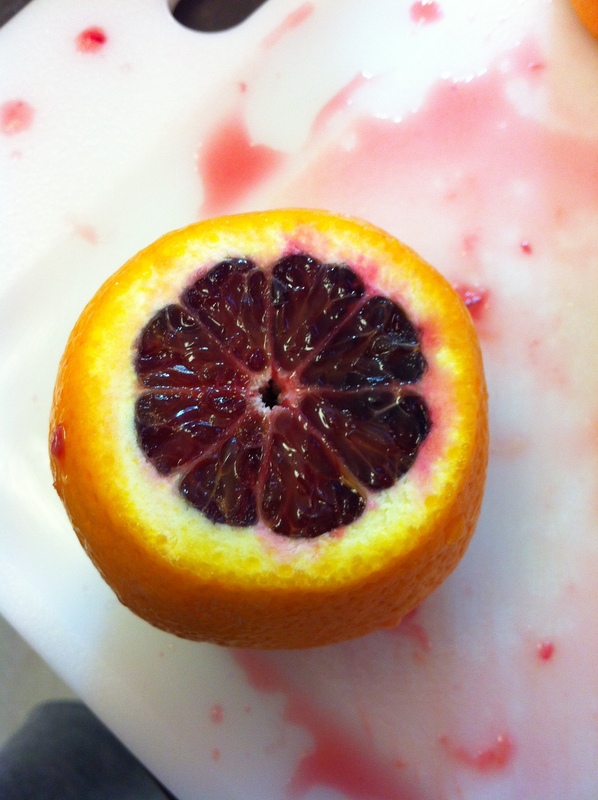 Cut the oranges into quarters, cut out the center pith, and remove the seeds. 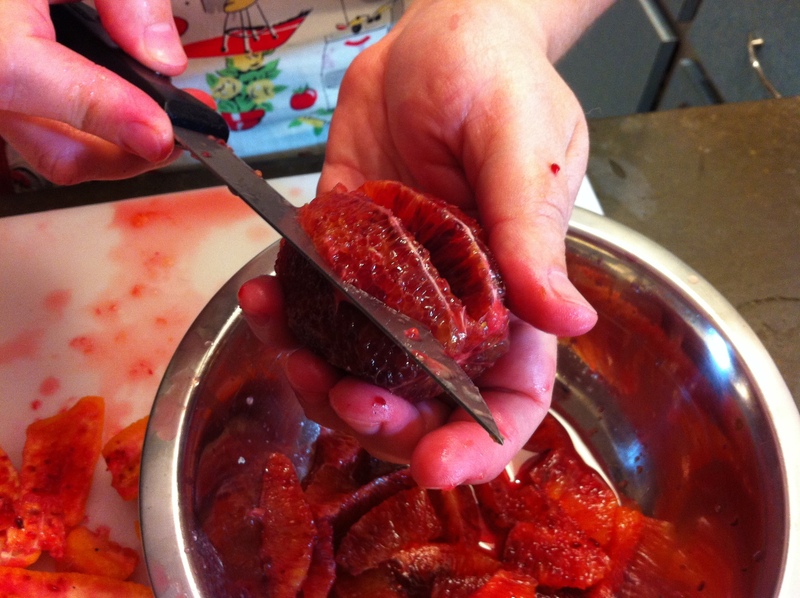 Slice each quarter very thinly and put into a large stock pot. 2. Segment the remaining 3 pounds of oranges. 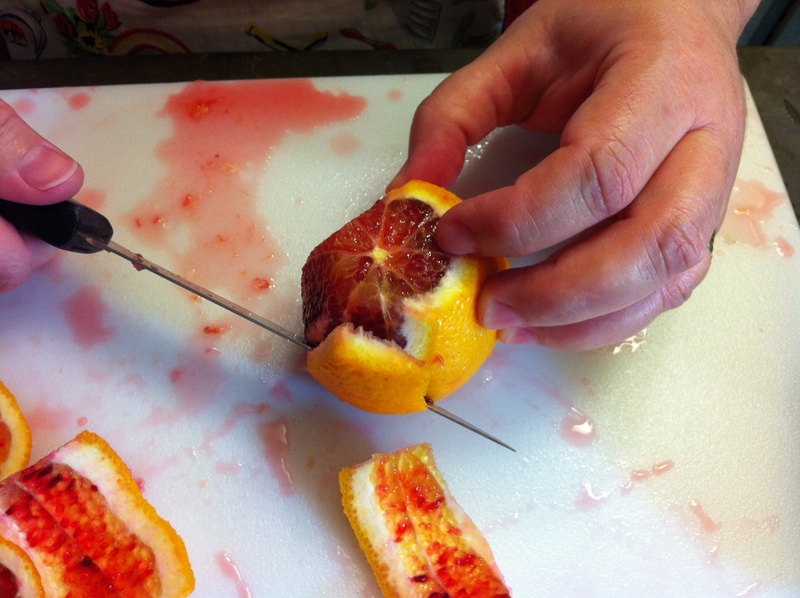 Do this by cutting away the peel and pith all the way down to the pulp. Cutting the peel off the oranges. Then, cut the segments out from between the segment membranes (you’ll see them; they look like white lines). 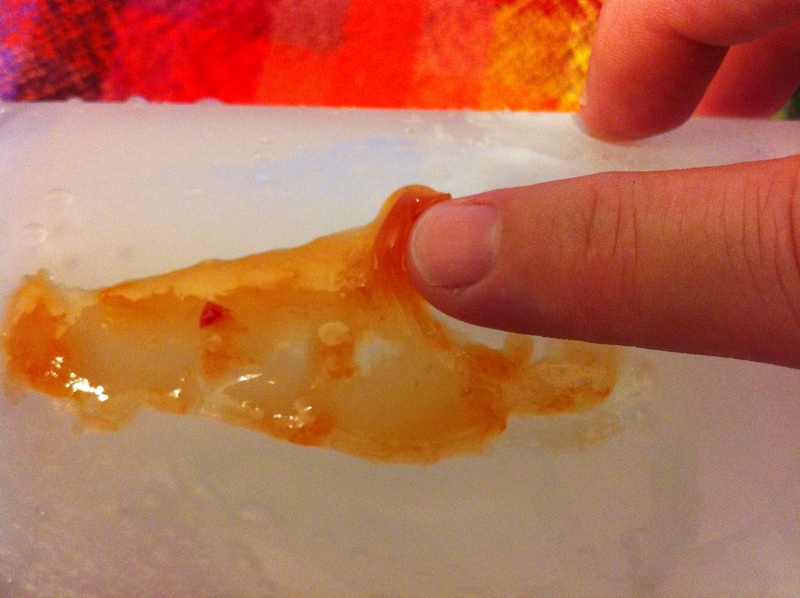 The center membrane with the segments cut out. Be sure to squeeze it to extract as much juice as you can. 3. 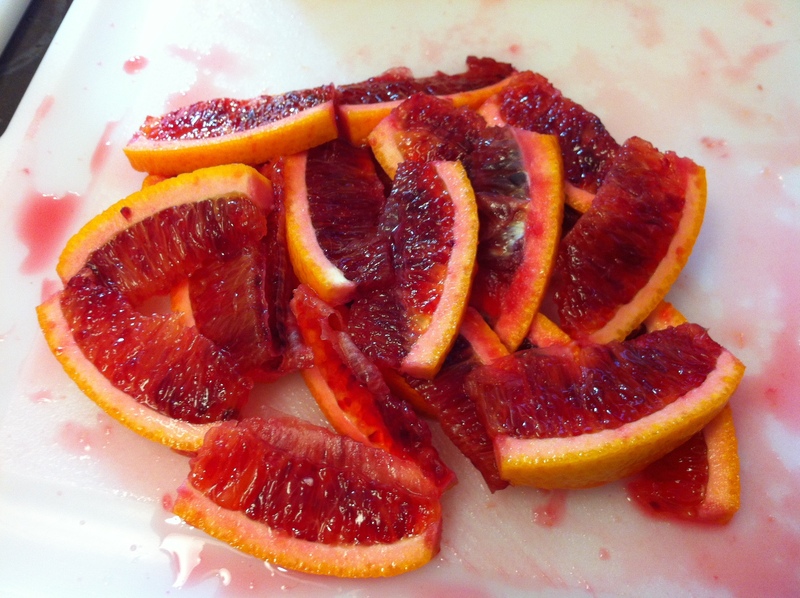 Add the reserved juice, lemon zest, lemon juice, and 4 c. blood orange juice to the pot with the oranges. 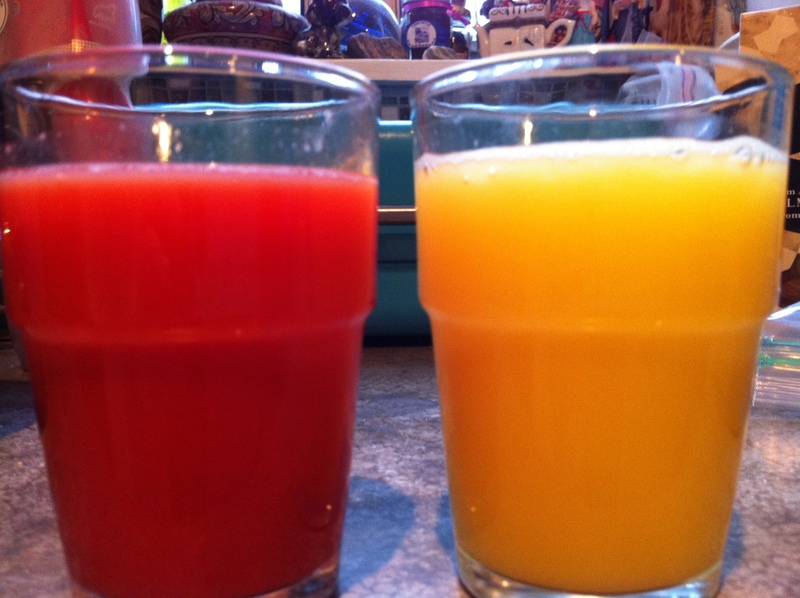 Comparison of blood and regular orange juices. Bring to a boil over medium heat, stirring frequently. 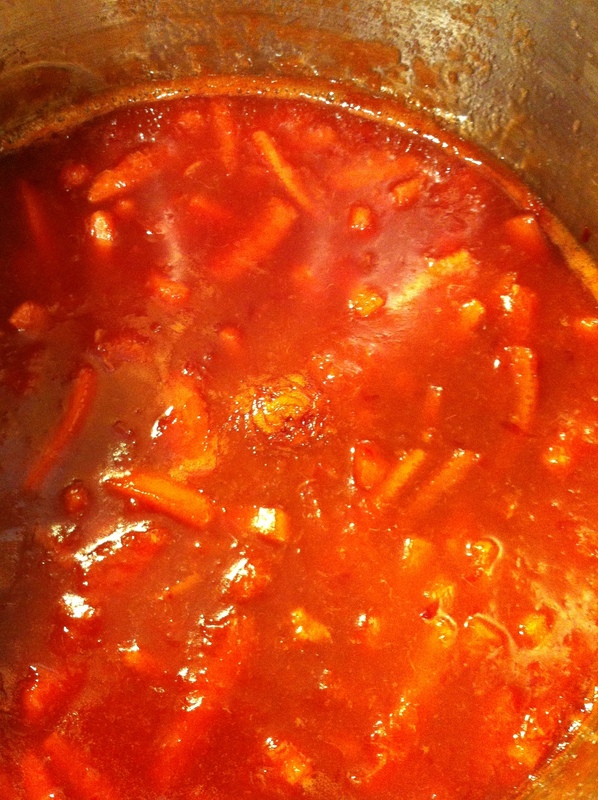 Once the juice comes to a boil, turn the heat down to medium-low and simmer for 45 – 60 minutes. The pulp should be broken down and the peel very soft. 4. After the oranges have cooked, if you are using Pomona’s pectin, stir in the calcium water. (Calcuim powder comes with the pectin). If you’re not using Pomona’s, skip this step. 5. In a separate bowl, stir together the honey and pectin. Add to the orange mixture. Stir well to combine. 6. Turn the heat back up to medium and bring the marmalade back to a boil. Stir almost constantly to prevent scorching. It should thicken within 5 – 10 minutes. Cooking the marmalade. The thermometer is to check the temperature. Ideal jelling comes at 220F. Test the set by pouring a small amount of the marmalade on a plate that has been chilled in the freezer. It should set up quickly and when you run your finger through the marmalade, it should “wrinkle”. 7. 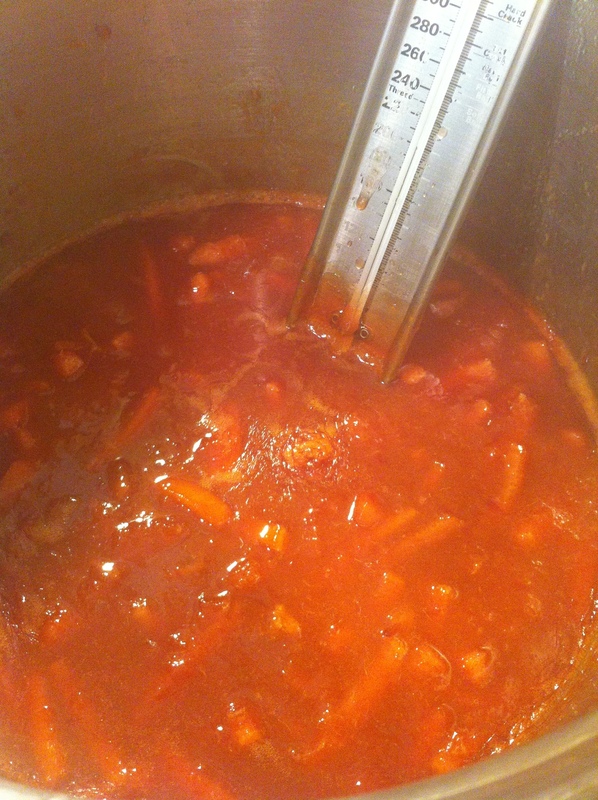 Ladle the marmalade into hot, sterlized jars, leaving 1/4″ headspace. Process the jars in a boiling water canner for 10 minutes (begin timing after the water has come to a boil). Let the jars cool on racks. The marmalade will set up as it cools. Makes approximately 5 half-pint jars.